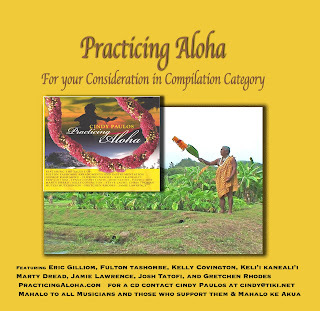 I'm so excited to announce that Practicing Aloha made it to the final nominations for a Hoku in the Compilation category.. This is such an honor and I want to thank everyone involved for their help in making this possible. I plan to be going over the weekend of May 28th and 29th. The award ceremonies will televised on May 29th at 7:30 . If anyone is planning to go I would love to be able to arrange a way we can connect while there. If there is any way you can think of to help promote the vote which ends May 6th I would really appreciate your suggestions. As you know this project was made possible with many people's help and it is really wonderful to see it recognized by the professionals in the industry.